Lucy Kueng is a professor and internationally-acknowledged expert on strategy, innovation and leadership, with a strong focus on the impact of digitalization. She both advises organizations and researches best practice worldwide. Close involvement with leading players in the digital space, coupled with strong analytic skills, mean she can identify strategic options, change levers and organisational priorities at speed. Her recent report, Going Digital. A Roadmap for Organizational Transformation, published by the Reuters Institute, Oxford University and the Google Digital News Initiative, explains how leading companies such as The Washington Post, Axel Springer, Vox, The New York Times, the Financial Times and The Economist are increasing agility, merging the cultures of journalism and tech and mastering innovation. Lucy keynotes frequently at industry conferences and is author of numerous books and reports including Going Digital. A Roadmap for Organisational Transformation (2017), Innovators in Digital News (2015), and the prize-winning Strategy in the Media Industry (second edition 2016). 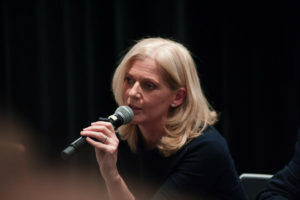 She holds a PhD and Habilitation from the University of St Gallen in Switzerland, an MBA from Ashridge/City University, UK and from 2008-2010 she was President of the European Media Management Association.